Make sure that your wedding day is as fabulous as you are! Reward your staff? Throw a party for them! 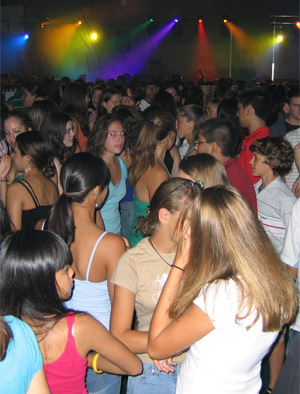 Sound Obsession wants to make your school event a blast! Let us help to take your party to the next level! Smooch, Smile, or Photobomb... Your choice with Photo Booth! How do you impress and reward your students? Let Sound Obsession plan and deliver an amazing event! Our DJs are energetic, interactive, experienced and know exactly what it takes to create a fun atmosphere for students! We have a variety of DJ personalities to suit your needs. All DJs are 100% liability insured and we are skilled in planning and hosting elementary, high school, and post secondary events! We are just as thrilled about your event as you are! We do whatever it takes to ensure the level of excitement lasts all night long! Sound Obsession DJs understand that students want to hear all the current hits! We are constantly updating our music libraries to stay current. Our library is completely censored for school events; we only play radio friendly versions of all songs. Sound Obsession DJs also know how annoying it is when students don't get their requests played, which is why we will play 100% of your requests! Book a face to face consultation (Book a consultation now) and together we can create an amazing experience! For rates, please contact Sound Obsession directly as we have many packages to suit your needs. Enhance your school event by adding an Intelligent Lighting package, ask us how! !